The use of hot electrons generated from the decay of surface plasmons is a novel concept that promises to increase the conversion yield in solar energy technologies. Titanium nitride (TiN) is an emerging plasmonic material that offers compatibility with CMOS technology, corrosion resistance, as well as mechanical strength and durability, thus outperforming noble metals in terms of cost, mechanical, chemical and thermal stability. In our recent article published in Advanced Optical Materials, we report Plasmonic TiN provides 2 times larger generation of over-barrier hot electrons than Au nanoparticles due to a broadband absorption and improved electrical compatibility at the TiN-TiO2 interface. 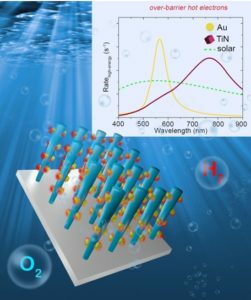 TiN nanoparticles decorated TiO2 nanowires enhance the photoelectrochemical water splitting activity compared to Au nanoparticles. This discovery enables the use of plasmonic nitrides in solar energy conversion. Naldoni, A., U. Guler, Z. Wang, M. Marelli, F. Malara, X. Meng, L. V. Besteiro, A. O. Govorov, A. V Kildishev, A. Boltasseva and V. M Shalaev, “Broadband hot electron collection for solar water splitting with plasmonic titanium nitride,” Adv. Opt. Mater., 2017, 10.1002/adom.201601031.